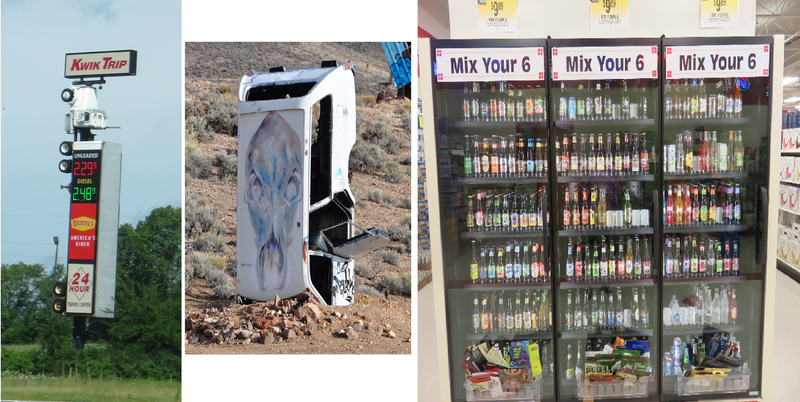 Road Trip Days 18-20 - Express Ferry, Crazy Water Tap, Weird Signs, Bugs and a Rattlesnake Warning Sign! It was a struggle to leave Toronto, but we were off early. The day before I had started to really feel off - dizzy and nauseous. It was only by the grace of Gravol I made it through dinner at El Catrin. But I was determined and the meds did the trick, allowing me to feel normal and enjoy the meal. That was short-lived as today it was worse. I woke at 4-5-6 a.m. and finally gave up. It took a little time to get myself car-ready, but we were on the road by 8 a.m.
As our trip driving from Minneapolis to Kalamazoo via Chicago was so awful, we decided to take a totally different way back. Enter the Lake Express - a fast ferry service between Muskogen, Michigan, and Milwaukee, Wisconsin. This let us by-pass the worst of the construction and traffic and do it from the comfort of a cushy chair. It was pricey, but worth every penny - especially as this was the first of 4 days of straight driving. It also ended up saving us over a half day of driving time. They recommended motion sickness medication as it was a choppy day, so I popped 2. They not only kept me from getting motion sickness, they took care of the general yucks I was experiencing - a two for one effect. Rather than give a day-by-day account, I think it's easier to cover these days by just sharing things that caught my eye a la Mr. Rogers style. Once you get away from the more dense states, a road trip takes form by slowing down and noticing the small things such as the wide variety of road signs. We saw everything from this sign designed to look like a big rig, to rusty farm equipment parked by the highway sporting ads, to an actual car standing on its front end with an ad for an auto repair shop painted on its hood. Unfortunately these fly by unexpectedly so it's hard to snap photos. Our stop at a liquor store introduced us to a concept I hadn't seen before - make your own 6 pack! Right a mix and match beer/cooler fridge with empty six pack holders at bottom. Couldn't resist showing you a video of how the Airblade works. Most gas stops along major interstates have serious mini-marts attached as their main customer is travelers. One offered a breakfast bar under heat lamps second to none. It even had drive-in style hash brown patties. Another had a mini-mart on the left and a nice restaurant on the right. In the walkway in between was the most amazing Wisconsin Cheese Co. display. It would put most grocery stores to shame. There were lots of unusual things that caught my eye in Minnesota. First was when we were again in a slow construction zone. Someone next to me was driving an old rust bucket of a car. To give it charm he had decorated it by covering it in old fashioned buttons. If I hadn't been behind the wheel I would have snapped a picture. Then there was the craziest establishment name and sign I saw from the road - The Space Aliens Grill & Bar. Turns out there are several. the road miles away. You just don't get that perspective in the city. After all the traffic and construction delays we experienced in Michigan, Wisconsin and Illinois, we really loved heading into North Dakota. Immediately things became easier. Even if there was construction, the lower traffic volume meant it rarely slowed you down. I didn't manage to snap a picture of the North Dakota...The Rush Hour Commute sign, but thankfully someone else did. The other thing I love about driving in the Midwest's wide open spaces is a connection to the weather. You can look miles ahead and see where clouds are dropping rain while you are in a sunny area. We can't get that perspective in the city. See the image on the right above. I cannot begin to describe how huge the RV on the left was and it was the first one I saw towing a truck behind it. The dirt here was a salmon red colour and could be seen on exposed digs and in the slashes of dirt roads running along side fields. Almost every hotel we stayed in had their TV's turned to Fox News in the breakfast areas. Bugs splattered the windshield so frequently that each gas stop was also a window cleaning adventure. The sheer size of some of the RV's we saw was also incredible - as big as semis with trailers - and occasionally they tow equally impressive vehicles. Another thing we observed on both our way East and on our return home West was the large truly large number of big rigs moving merchandise and equipment. This was especially clear in any construction zone that slowed us down. Half of the vehicles would be rigs. I had no idea how dependent the economy was on the trucking industry. 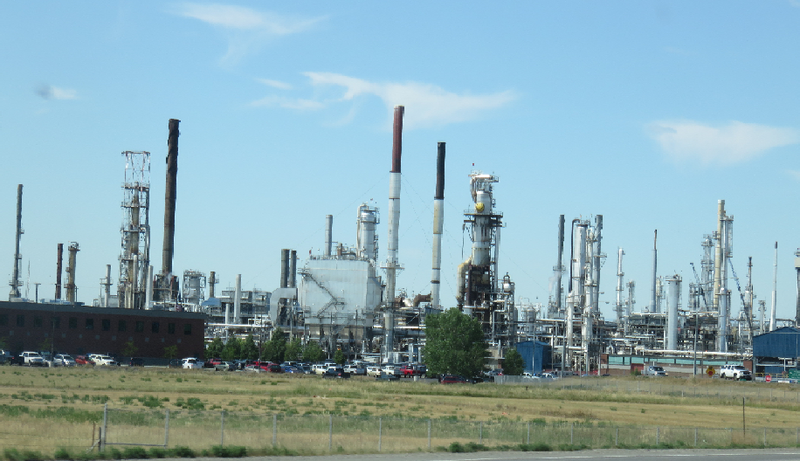 Then there were the large refineries we drove by alongside the interstate in Billings. The sheer number and variety of vertical pipes was astounding. What was the unique use for each? And every barn we saw, no matter what the state we traveled, was painted red. There are a few theories as to how this started, but it became fashionable in Europe and the tradition was brought to North America. Last but not least are some boxes we saw in a field in Montana. Best we could figure out was that they were portable bee hives that could be closed up and moved from field to field. The Continental Divide was a real poser for me. I honestly did not remember exactly what it meant. 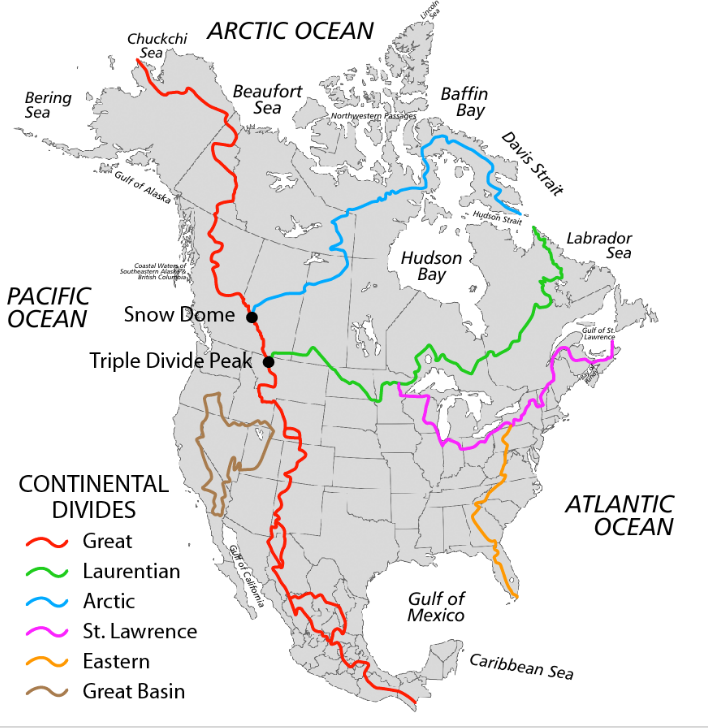 In laymen's terms, all the rivers West of the divide eventually run into the Pacific Ocean and all the rivers East of the divide into the Atlantic Ocean. It is a meandering line we crossed many times around Yellowstone National Park. Then out of the blue I saw a sign for it in North Dakota which made no sense. In looking it up, the main one most of us know is not alone. There are several others and one dips into North Dakota. The red line on the map above is the Great Divide that is what most refer to. The coloured lines are others. It's complicated. You can learn more HERE. Left, Painted Canyon rest area view- Right, Rattlesnake warning sign on path to picnic tables at another rest area. Glen and I used our lunch as a time to enjoy being out of the car. That meant carrying an ice chest full of edibles and stopping in rest areas along the way. All rest areas are not created equal. While most of these are roughly the same, there was a wide range. As mentioned above, the ones in Wisconsin had hi-tech faucets. Then there was one in Montana that had a rattlesnake warning by the trail to the picnic table. We had one placed right in town by a noisy freeway and another set at the truly stunning Painted Canyon in Montana's Theodore Roosevelt National Park. After 4 days of travelling, we landed gratefully in Missoula, Montana. The scenery along the way had been interesting and diverse. The driving easy. But after 4 days we were ready for a break from the car. 2 nights - 1 full day - in Missoula is not a lot of time, but I intend to enjoy it fully.